Prosthetic restoration of the anterior teeth is a major esthetic challenge. Esthetic treatment consists of creating pleasantly proportioned teeth and integrating them harmoniously into the patient’s gingiva, lips, and face. 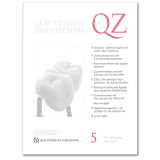 The communication of clinical data to the laboratory is critical to the success of any esthetic treatment. The purpose here is to present a straightforward, efficient, and reproducible means of communicating esthetic specifications to ceramists, allowing them to work as though the patient was actually in front of them, with access to all of the major facial esthetic criteria. In any harmonious face, the incisal plane is parallel to the interpupillary line, and the interincisal line is parallel to the facial midline.1 The most common mistake in esthetic dentistry is to disregard these basic rules.4 Such mistakes are due in large part to the difficulty of accurately communicating patients’ esthetic specifications to the laboratory. Herein will be presented a new device called the Ditramax, which allows the technician to record the facial esthetic reference lines and transpose them directly onto the working cast used to build the prosthesis. This device can be used during the diagnostic waxup stage; during the provisional restoration, as well as for final prosthesis. Dental technicians can therefore work as though the patient was actually in front of them. 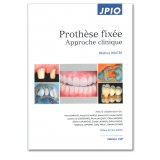 They are able to optimize the esthetic integration of the prosthesis from the beginning, thus avoiding a succession of fittings and shape corrections of the ceramics. Front centering of the facial midline: a micrometric screw is used to position the central graduation of the ruler onto the patient’s facial midline. In cases of symmetric faces, the pupillary graduations can also help with centering. (4) Lateral centering of the facial midline: the device is adjusted so that the two side rods are equidistant to the right and left tragus. (5) Camper’s plane: from a lateral point of view, the device is adjusted so that the rods are parallel to Camper’s plane. At each step, the measurement is locked with an individual screw. Finally, all of the alignments and the centering of the device are double-checked. The device is then removed from the patient and positioned on its stand (Fig 3a). Once the device is on the stand, the Camper’s rods are removed and a tracing template is screwed to the device at the most suitable level (three possible heights) (Fig 3b). The working cast is then positioned on the fork, where it fits perfectly because of the occlusal indentation in the silicone. A stylus is used to trace the cast through the template: the horizontal line is placed parallel to the interpupillary line (front view) and Camper’s plane (side view); the vertical line is placed at the facial midline (Fig 4). The traced cast is now ready to be sent to the dental technician for prosthetic elaboration (Figs 5a and 5b). centering: the device must be adjusted so that the two side rods are equidistant to the right and left tragus, so that the frame plane is parallel to the patient’s face. (5) Camper’s plane: from a lateral point of view, the device must be adjusted so that the rods are parallel to Camper’s plane. Fig 3 The entire device is removed from the patient and positioned on its stand. Both Camper’s rods are removed and the tracing template is screwed to the device at the most suitable of the three available levels. 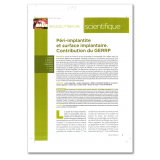 The communication of patient facial esthetic specifications to the laboratory is a key element that determines the success of esthetic dentistry. The use of a facebow allows for proper orientation and positioning of the maxillary cast on the articulator according to joint anatomic references. Although this positioning is correct from an occlusal point of view, it is often a source of error from an esthetic one.5,6 Indeed, in 20% of patients, there is a lack of parallelism between the interpupillary line and Frankfort’s plane, leading to a non-esthetic integration of clinical restorations.7 Thus, crowns that are in a perfect position on the articulator end up tilted in the patient’s mouth.5,8 The ceramist then must correct both the shape and the axis of the teeth, destroying at the same time a major part of the incisal edge effects and spoiling the esthetic aspect of the ceramic with multiple firings. 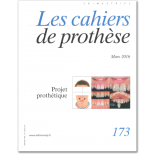 In some extreme cases, the ceramist must redo the prosthesis completely.1 Several suggestions have been published with the aim of improving the orientation of the working cast on the articulator. 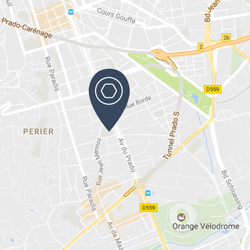 For example, photography is a valuable means of clinician-to-technician communication.1,9 It provides the ceramist with information about the patient, such as age, gender, facial type, and skin color. 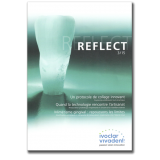 However, even if a photograph of provisional restorations or fittings allows the ceramist to see that the incisal plane is canted compared to the horizontal reference, it is impossible for him or her to quantify it and therefore to make the proper corrections. 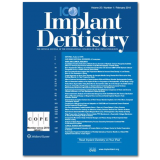 Using the provisional cast as an esthetic reference is a good option, but would necessitate that provisional casts be perfectly integrated from an esthetic point of view. The canting of the incisal plane is easily visualized by marking the mandibular teeth, or by using a silicone index,6,10 but the canting of the incisal midline is harder to outline with the same technique. Several authors have proposed the “modified facebow” technique, which consists of parallelization of the side pieces of the facebow to the horizontal esthetic references of the patient.1,4,6,11 Although the technique sounds straightforward, the correction bends the condylar position compared to the maxillary cast. 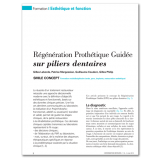 As outlined by Chiche and Pinault,1 further adjustments of dental occlusions involved in lateral function are required. Some authors prefer the horizon over the interpupillary line as the horizontal reference. This technique requires a facebow to fit with a spirit level to provide the horizontal orientation.12 However, the use of the horizon as the only reference is risky, as it does not fit to all situations. Indeed, the clinician must be able to distinguish between an actual facial asymmetry and a simple bent-head carriage. In cases of actual facial asymmetry, the horizontal reference plane to consider could be the average of the interpupillary, intercommisural, and horizon lines. On the other hand, in cases of bent-head carriage without facial asymmetry, the interpupillary line remains the horizontal esthetic reference and therefore this technique is inappropriate. In all cases, the technique shares the same occlusal disadvantages as the modified facebow. A solution proposed by Chiche, called the “Cast Indexing Technique,” was the impetus for the development of the Ditramax device. This technique entails marking the base of the maxillary cast with a horizontal line parallel to the interpupillary line.13 However this marking can be unreliable, because it is very difficult to trace freehand. It is important that the technician has the same perception of the maxillary, as does the clinician facing the patient. With symmetric faces or when the modified facebow technique is used, the maxillary part of the articulator provides the technician with a horizontal reference to follow. However, this reference is not close to the restoration zone (it is approximately 7 cm away), making it difficult to use. Moreover, the visualization of the ceramist is substantially influenced by the cast base, which is, in contrast, very close to the restoration zone. The cast base is trimmed in the laboratory in an arbitrary manner, most often using only the remaining teeth, the gingival level, and the preparation axis as guides. The dental stone for the cast base should be the same color as that of the arch, in order to avoid disrupting the optical perception of the ceramist. Because of the cast markings made with the Ditramax device, it is possible to trim the base parallel to the horizontal landmark, and the edges perpendicular to it. Therefore, the technician has at his disposal a cast base perfectly oriented and marked with two lines: a horizontal line parallel to the interpupillary line in the front view and Camper’s plane in the lateral view; and a vertical line representing the facial midline. The separation axis of the dies must be oriented with regard to the vertical landmark on the cast to emphasize the optical perception of the vertical reference line (Fig 6). This is even more important when the ceramist is working on the model while holding it in his hand. The interincisal midline is rebuilt according to a parallel of this landmark, and will not necessarily merge with it.1,14-16 It will be centered with regard to the maxillary central incisor roots, or will run on from the intermaxillary bone suture if the central incisors are missing. In the lateral view, the cast is marked with a line parallel to Camper’s plane, providing invaluable information about the orientation of the occlusal plane.17 The maxillary cast, marked with the Ditramax device, can be positioned on any type of articulator by means of a standard facebow recording, with no alteration of occlusal data. This is particularly important in cases of full arch or several anterior teeth reconstruction, as it allows perfect occlusal and functional guide adjustments. 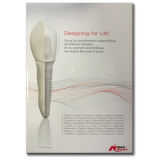 As a result, the ceramist has access to all the information necessary to create a perfectly integrated prosthesis from both esthetic and functional points of view (Figs 7, 8a and 8b). Prosthetic restoration of the maxillary anterior teeth represents a major esthetic challenge. 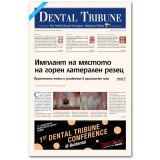 The esthetic diagnosis is based upon the position of the patient’s teeth in relation to the gingiva, lips, and face. The Ditramax system allows for the straightforward casting of the interpupillary line (the horizontal esthetic reference line) onto the oral area, which is used to identify major esthetic errors and then to develop a therapeutic program that will lead to a harmonious and natural looking dentogingival solution. 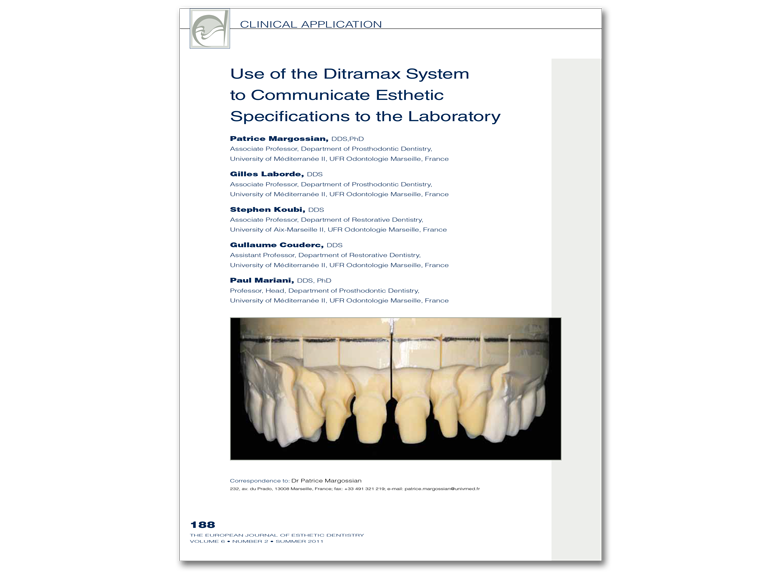 In addition to its diagnostic utility, the ability of the Ditramax to accurately represent all of the reference lines in the laboratory allows for a substantial reduction in dental layout errors. The reliable and reproducible projection of Camper’s plane, the interpupillary line, and the facial midline onto the cast near the working area, will greatly facilitate the technician’s work, and will ensure better esthetic results.